seen in the form of three natural rock formations or simply called as the 'Pindiyas'- one of Maa Saraswati, one of Maa Lakshmi and the third one of Maa Kali. wrong path) everywhere. 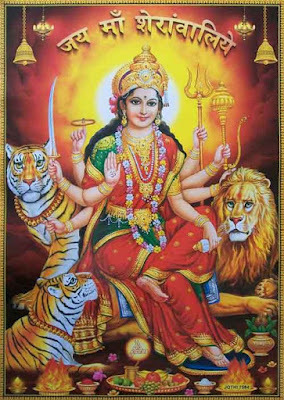 Maa Vaishno Devi came into light when Mother Goddess Kali, Maa Saraswati and Maa Lakshmi appeared together and 3 of these Devis or Goddesses formed one Goddess which came to be known as Maa Vaishno Devi. So Mata Vaishno Devi is in the form of three pindies (Sacred stones) as physical true forms of three Goddesses and it is beleived that the 3 pindies will be present till the end of Kaliyuga. She was later born as the daughter of Lord Ratnakar. The parents named her Vaishnavi. Since childhood, Vaishnavi was extremely spiritual and as her soul was of Lakshmi so she wanted to have Sri Hari Vishnu as her consort. Because of her divine presence on earth, every living being became happy. Where Vaishnavi resided, that place became heaven. During the vanvaas or exile period of Sri Ram, Vaishnavi met Sri Ram. As Sri Ram was the avataar of Sri Hari Vishnu, she decided to go with her. But Sri Ram told her that he was Maryadapurushottam and his wife is Sita. Sri Ram promised Vaishnavi that he will come in the form of Lord Kalki in the age of Kalyug and at that time, she would be merged with him. Sri Ram then asked the divine Goddess Vaishno to stay and setup her abode in Trikuta Hills and spread Dharma. Goddess Vaishno Devi is the Mother Goddess on Earth during this present age of Kali Yuga. Millions of devotees from all over the globe travel to this highly spiritual destination of Hindus - Vaishno Devi. Devotees after halting at (present day) Banganga, Charan Paduka, and Adhkwari, finally are able to reache the holy cave Shrine of Mata Vaishno Devi. It is believed that Mata Rani stayed in the holy cave of Adhkawari for 9 complete months and this 9 months also signifies the 9 months of preganancy. Lord Hanuman waited for the mother goddess and guarded her outside the cave. Mata Vaishno then wanted to wash herself but as no water could be found there, so she took an arrow and striked it towards the land and water came out from that place. It is same place of present day Ban-Ganga. The river was named Ban-ganga after this. After that, she came to the present day Shrine of Mata Vaishno Devi and took rest and started meditation. Bhaironnath when came to know about the presence of Mata Vaishno went there but was stopped by Hanuman. After a fierce battle with Goddess Vaishno, Bhairon Nath was killed and beheaded just outside the mouth of the cave. The severed head of Bhairon Nath fell with force on a distant hilltop. Bhairon Nath soon realised and prayed to the Goddess to forgive him. 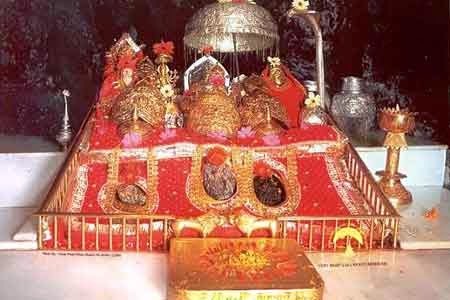 Mata Vaishno Devi then gave mercy to Bhairon and even gave him a boon that every devotee coming to visit the Mata Vaishno Devi Shrine would have to visit and have the Darshan of Bhaironath after having the Darshan of the Goddess and only then his/her Vaishno Devi Yatra would be completed. After this, Maa Vaishnavi decided to shed off her human form and took the face of a 3 rock formations and she immersed her self into meditation forever. This is the original Mata Vaishno Devi pindies. Mata Vaishno Devi Shrine Board is the official body taking care of the whole of the yatra and maintaining the Shrine. Neareat rail link for Vaishno Devi is from Udhampur to Katra and nearest airport to Vaishno Devi is Jammu Airport. Mata Vaishno Devi aarti "Jai Ambey Gauri"
Vaishno Devi Aarti is held twice a day. The first Maa Vaishno devi aarti is held in the morning and the second Maa Vaishno devi aarti is held in the evening after sunset. The time of the Maa Vaisno Devi aarti changes depending upon the sunrise and sunset time. The aarti of Maa Vaishno Devi takes nearly two hours to complete and the darshan is stopped during that time.